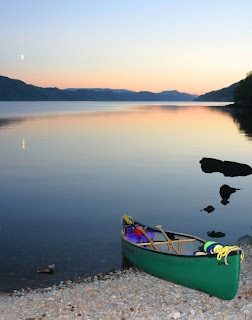 Ok, so your dreaming about your first expedition in your newly purchased Canadian Canoe. You have read a few magazines, practiced a few 'J' strokes on the local lake and have even chatted to someone who did the trip by kayak over 10 years ago. This was me just a few weeks ago. 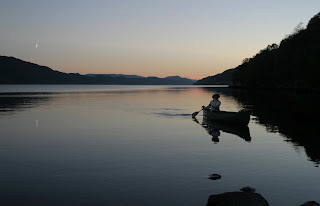 For years I had dreamt of paddling in wild and remote places, so this year I decided to take the plunge and booked myself and hubby onto an 'introduction to Open Boating' course at Plas Y Brenin. Within five days we went from never having held a paddle to running grade 2 white water (terrified and out of control, I must add).By the fifth day hubby, Eric (who we'd met on the course), and myself had decided that we had all the skills and confidence for our first expedition. This monumental decision was taken in the bar after quite a few drinks and may have impaired our judgement slightly. A date was set, location agreed and all we had to do was get the kit together. Airbags, waterproofs, bivvys, torches and dry bags were all bought easily enough. Our first problem came when I realised the car (I had two weeks earlier begged my husband to buy) was a little small. He had wanted a big green deisel estate, pratical, spacious and even had a roof rack. Next to it was parked a little two door coupe, tinted windows, great stereo and the roof the size of a postage stamp. Need I say more?With some difficulty we eventually found a roof rack that fitted and with lots of straps, gaffa tape and crossed fingers it did the trick. We arrived in Fort William late afternoon and booked into a great little B&B called 'Mansefield Guesthouse', situated just 500 yards from the top of Neptune Staircase, which was to be the starting point of our expedition. We met up with Eric and his mate Dave down the local pub and nervously looked at the map, at the long blue lines and blobs that made up our route through the Great Glen. The trip would be 60 miles long and would take us right across Scotland, ending in Inverness.We were up early and made our way to the harbour masters office situated in Corpach, to pick up the important toilet key and our canoeing licence (free) that we needed to go along the canal itself. We kitted out the canoes and pushing off from a small pontoon started our adventure. Despite the torrential rain we were all ecstatic to be actually there and actually doing it. Everything was going perfectly for about an hour!Out of the blue, the light sound of splashing water from our paddles was drowned out by the engines of a huge fishing trawler that seemed to be racing towards us. We kept calm and expecting quite a large wake to follow, paddled as quickly as we could to the side of the canal. Eric decided to take this opportunity to hop out of his boat for a quick pee. Little did he know what was to come! As the trawler passed us, the water in the canal seemed to get sucked away, we dropped about two feet and were quickly being dragged towards the hull of this huge boat. Just when we thought we were done for, we stopped. Hubby and I were both quite shaken but breathed a sigh of relief that we hadn't gone in or under. Then from over hubbies shoulder I spied the biggest wall of water I have ever seen. This was the wake we had earlier been patiently waiting for. It must have towered at least four feet above us. Lost for words I held onto the boat and closed my eyes. Up and up we went, rocking from one side to the other. The water had now started lapping the top of the canal bank. Suddenly, we were motionless. The water went down and the canal went back to its original tranquil self. Hubby and I on the other hand were in our canoe, two feet out of the water sitting on a great big rock. What a sight we must have looked. Moments later Eric appeared having finished his peaceful pee. The look of disbelief on his face was amazing. We are sat two feet above the water level and poor Dave; having been dragged along by the trawler was 200 yards further down the canal! Dave (who's only previous experience in a canoe totaled two hours on a river) finally managed to paddle back to us and pick up Eric for the next stretch of the journey.It wasn't long before we came to our first lock gate and our first portage. What a nightmare portage is! Firstly having to unload all the gear from the boats then dragging them up very steep banks, which felt almost verticle at times. At this point I recommend to every reader to buy or make some canoe wheels. Also at this point I would like to mention ''Food'. Realizing portage would be one of the drawbacks of this trip I had spent the entire previous week preparing the lightest, driest, most space saving food thinkable. Porriage oats with dried milk rationed into little plastic bags, pasta, nuts,dried fruit and suger even the smash had been taken out of its original packaging and bagged up. I must admit I was quite proud of all the thought and effort I'd put into the resulting lightweight yet versitile food bag we had. Eric and Dave on the other hand had decided to stop at Tesco's on the way up. Purchased 12 tins of curry, one tin opener, three 6 packs of beer and two boxes of wine and were equally pleased with their provisions.It was now early afternoon and we had reached out first Scottish lake 'Loch Locky'. 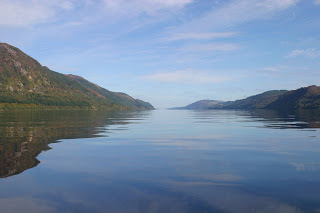 11 miles long, 500 feet deep and due to the imposing steep forested sides of the Great Glen probably the most dramatic of all the lochs. So impressive were the surroundings you could have easily imagined yourself on one of the North America's great lakes.The weather was still horrid but the wind had turned and was now behind us, which was great as we could sail for a while and rest our arms. We had purchased a small canoe sail before we left and Eric and Dave had brought along a big green and white golf umbrella, which worked just as well. Sailing is great fun and I reckon we averaged about 8mph along that loch. We got caught in a couple of nasty scrawls, where we all regretted being quite so far away from the shore. The swells got up to two foot and we all got wet from water washing over the sides.Our improvised cut up plastic bottle bailer, worked a treat at this point. We reached the end of the lake very cold and tired and decided to set up our first wilderness camp on a tiny headland. The fire was lit and we were soon warm and well fed. As he had done a night class in indian cookery some years ago Dave was nominated as chef. The rain stopped and as we sat watching three young otters playing on the shore it soon turned into a wonderful evening. Then out of nowhere we heard a landrover. Two minutes later a farmer, flat cap and wellies appeared demanding £3.00 a tent. None of us had the energy to move so we paid and sat wondering how the farmer had managed to reach us without a boat? At this point I would like to warn you about the little known Scottish tree slug. Its purpose in life is climbing trees, positioning itself perfectly, then dropping effortlessly into your cup of wine.We woke up about 7am the following morning. There was a thick mist on the Loch and it was bitterly cold. It wasn't far to the next lock so we paddled through the mist and luckily got our bearings right. This portage wasn't too bad and there were showers and a toilet. I was desperate to have a good wash until I saw the signs on the wall. 'Under no circumstances let this water contact your eyes or mouth while showering'. I decided smelling was all a part of the expedition experience.We soon arrived at Loch Oich only four miles long. It was beautiful. Water like a millpond; I could have done my make up using my reflection on the water. The sun shone all day, a few miles of canal and a lock later we had reached Fort Augustus, the official halfway point.That evening we booked into another B&B called 'Nia-Roo Lodge'. A lovely man called Bob (who reminded me of a leprechaun I had seen in a film as a child) ran it. Nia-Roo Lodge was friendly and warm and the breakfast was great. Bob even let us leave our car in his yard for the remainder of our trip. Well-fed and rejuvenated hubby and I restocked our canoe and prepared for the next leg of the journey - Loch Ness. 22 miles long, over 1000 feet deep and when we arrived, covered in thick mist. We decided to paddle on the less popular northwest side of the lake. The main road runs along this side, which puts a lot of people off. As we were paddling, alone now, we felt happier knowing civilization was that little bit closer just in case of an accident. The road was covered with trees the entire way and we only occasionally heard the odd motorbike whizzing along. However, looking across we had definitely made the right decision. There were boats everywhere. A couple of small canoes would have struggled with the wakes alone. After five miles of paddling through the mist, the day turned out stunning. The sun shone and Loch Ness looked like a mirror. The weather was so great we decided to tick off as many miles as possible. A staggering 18 miles along Loch Ness we decided to make camp for the night. The only spot we could find was a pebbly beach. We held the bivvy tent pegs down with rocks and were grateful of our sleeping mats. This was to be our last evening of the expedition and it will definitely be one I will never ever forget. We sat on the beach and watched an incredible sunset, the colours reflecting on the lake, bright reds and oranges as if the water was on fire. It was magical. The moon came up and with it a shower of shooting stars. The only sound was the gentle lapping of water on the beach. We sat for hours looking at the most majectic landscape imaginable. Then out of nowhere, the gentle lapping changed as larger and larger waves began breaking on the beach. We looked out into the distance but there were no boats within miles of us. The waves lashed against the shore for a good three or four minutes then everything went still again. It left me wondering if there might be some truth to the Folklore after all!The following morning we woke to a bright red fiery sky. The lake had changed from a majestic mirror to a bubbling cauldron of spitting waves. We set off with the knowledge we only had four miles of this to endure. The waves just got bigger and bigger, they kept pushing us in the opposite direction. They towered above the canoe and several came splashing down over the back of the boat, drenching us both in the process. It was gone 11am when we finally reached the next stretch of canal and heard from a passing yachtsman that the winds were reaching 25mph on the centre of the lake. We were cold and tired and decided we would portage the next lock and would finish our trip just short of Inverness. I'm glad we did as we found a lovely little cafe for me to warm up in whilst hubby caught a bus back to Fort Augustus to collect the car. That's it; we survived and didn't even get a blister. If I had to do it again, I would definitely use wheels for the portage and would probably take it a little easier and spend a few more days out there.All in all this has to be the perfect trip for a beginner.